Beyond security, monetisation and connectivity. The European Commission, namely DG CONNECT and DG ENER, organise this dedicated workshop jointly with the alliance AIOTI. The workshop will tackle opportunities for blockchain as a means to realise the energy transition, from smart energy services based on IoT for connected appliances, smart mobility, to P2P energy trading and smart utilities. It will discuss in particular the role of blockchains as an enabler for data marketplaces and trading of energy, demand response and flexibility services, and for (community-based) investments in renewables. 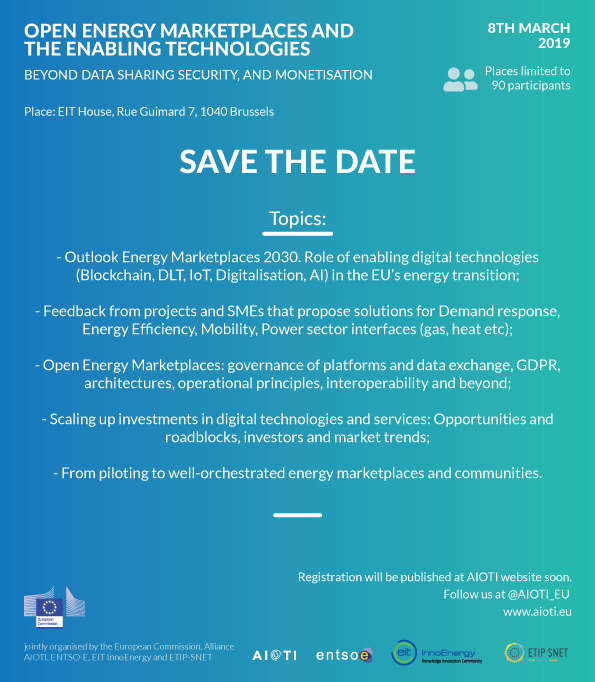 This event builds on previous seminars organised by the European Commission and blockchain and energy, firstly on 21 March 2018 that presented a broad overview of possible and practical (test) applications of blockchain in energy, and the workshop on the 22nd of October 2018 on OPEN MARKETPLACES TO SPUR INNOVATIVE ENERGY SERVICES. AIOTI, ENTSOe, ETIP SNET and EIT InnoEnergy jointly worked on a paper to elaborate on the key issues that came out of the last seminar of 22 October. This next seminar will present the draft paper to a wider audience, organised according to the four key themes in the paper, and discuss recommendations for actions that will promote the use of open marketplaces that will enable innovative digital solutions and services to grow. The aim is to make the workshop interactive: therefore we have reserved sessions for policy discussions as well as for discussion with SMEs and project developers, and throughout the day we have reserved time to discuss with the audience. This workshop is part of a series of IoT events related to data marketplaces. The terms of reference could be found here, and more background information could be found here.